La Poutine Week runs nationally from February 1-7, 2018, and Edmonton has 7 participating restaurants offering their take on the popular dish. The Silver Skate Festival will be offering a new food and beverage event this year called Spirits on Ice. Taking place on February 9-10, 2018, it will be an opportunity to sample items from businesses including Blind Enthusiasm, Urban Tavern, Rig Hand Distillery, and Pasta Pantry. Admission is free, but food and drink tickets are priced at 10 for $10. A reminder that the Taste Alberta #ABFoodFight Culinary Combat, in support of the Alberta Diabetes Foundation, is taking place on February 12, 2018. Linda is giving away a pair of tickets – enter prior to February 8, 2018. Avenue Edmonton will be hosting their launch of their annual food issue on March 5, 2018 at the Edmonton Expo Centre. Tickets are $50. A high-end pop-up dining series starts March 6, 2018 called The Nomad Cook. Tickets for the four celebrity chef dinners runs $1200 – it’ll be interesting to see what type of uptake they receive. NAIT is giving away 4 pairs of tickets to the March 15, 2018 lunch prepared by this year’s Chef in Residence Rod Butters. Enter prior to March 6, 2018. The latest restaurant to fill the revolving door location of 8 Mission Avenue in St. Albert is Riverbank Bistro. Travellers at the Edmonton International Airport looking for a local food option will be happy to see that Delux Burger Bar will be joining the fray in a couple of months, just off gate 56. Chef Cory Rakowski will be opening Kitchener’s Taphouse & Grill in Old Strathcona. Chef Shelley Robinson, who helped open the restaurants in the Grand Villa Casino, has left Edmonton for Banff. The Alder Room was vandalized on Friday – I hope they get back on their feet soon enough. Cafe Linnea is changing up their high tea this month – they’re moving from a weekly to a monthly themed service. Inferno Coffee is a new roaster in Edmonton. Started by a firefighter, Inferno is also raising money and awareness for post-traumatic stress disorder, with 5% of proceeds going to a PTSD charity. They offer free delivery in Edmonton. Vue Weekly profiles the family behind Destination Doughnuts. Ms. Hangry Foodie reviewed Ohana Donuterie. Vue Weekly has a pair of reviews for The Moth Cafe and Gui Lin Noodle House. 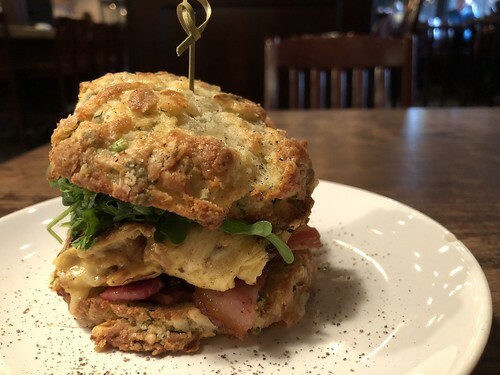 Sharon tried the baked goods and more substantial breakfast and lunch offerings at one of the newest cafes in south Edmonton, Brown Butter Cafe. Twyla loved the food at Chix Shack. I’m a big fan of the arepas at El Fogon so I’m happy that they’re getting more coverage – this time from Graham at the Sun. YEGCravings had a great experience at Let Eat Snow, and enjoyed a variety of dishes at T & D Vietnamese Noodle House. The Globe Diary’s latest brunch-venture took her to Pip, and she planned a date night at Woodwork. Awesome to see this glowing review of Zwick’s Pretzels, a definite gem in the local food scene, in the Globe & Mail. Graham reviews the pair of hot dog purveyors, Mayday Dogs and Montreal Hot Dogs, that opened in Ice District late last year. Sharman recaps what you missed at the last Taste Alberta Dinner, held at Prairie Noodle Shop. Jennifer Crosby (in for Ryan Jespersen) hosted a Restaurant Panel on January 29 with representatives from Duchess and Cafe Linnea, The Marc, and 1st Rnd sharing their perspectives on how the changes to Employment Standards have impacted their businesses. The latest That’s So Maven podcast features Lynsae and Marnie, the mother and daughter duo behind The Nook Cafe. Edmonton’s first kombucha micro brewery has launched a crowdfunding campaign with ATB BoostR. They hope to raise $10,000 to boost brewing capacity and modernize their bottling techniques. It looks like Edmonton has another food delivery service – Nomme entered the increasingly crowded market last week. With weather like this, it’s nice to look forward to summer – The Local Good’s very popular River Valley Medicinal Plant Walks is returning. The $60 tickets are still available for August 15. Cara Operations (who already owns chains like Swiss Chalet and Milestones), will be purchasing The Keg. I don’t go out for breakfast often, but when I do, I’m reminded of some of the gems in the city. This includes the bacon, cheddar, caramelized onions, eggs & arugula sandwich at Lock Stock Coffee. While it’s delicious with their house-made English muffin, I highly recommend upsizing to their herb and cheddar scone. As mentioned above, Mack and I are thrilled with our new arrival! Mack and I are absolutely thrilled to introduce Emily Fengcai (楓彩) Male! She was born on Friday, January 26 weighing 7 lbs 14 oz. We are busy learning about one another and enjoying all of the firsts (and trying to sleep when we can). We’re so in love! Thank you to the wonderful staff at the Royal Alexandra Hospital for making Emily’s entry into the world and our first few hours as parents so joyous and welcoming. We are very grateful!